that bring you joy -- Just wanted to pop in and share my latest album that is up on ebay! Once again the summer has been interfering with my blogging, lol! I have managed to scrap quite a bit though in between keeping my girls busy. This album really came together beautifully!! I used Pink Paislee's Butterfly Garden line -- gorgeous paper!! Lots of vintage lace and pretty trim in this one!! You can see all the pictures here on ebay! 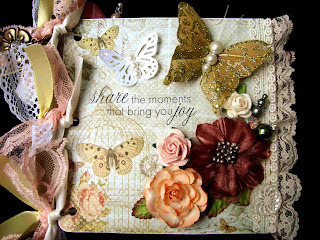 I just finished up a custom album this week for a sweet lady and I started working on a new album for ebay. I am using Echo Park's new Victoria Garden... think you will love this paper, just bright, happy, cheery goodness :o) Anyway, I am hoping that I can get it listed early next week. OK, I am off to do laundry and then taking my girls to the pool! Have a great weekend! !